Looking for an easier and more direct path to the teachings of Christ? Reading the entire Bible can be an overwhelming challenge, but learning what Jesus taught doesn’t have to be! 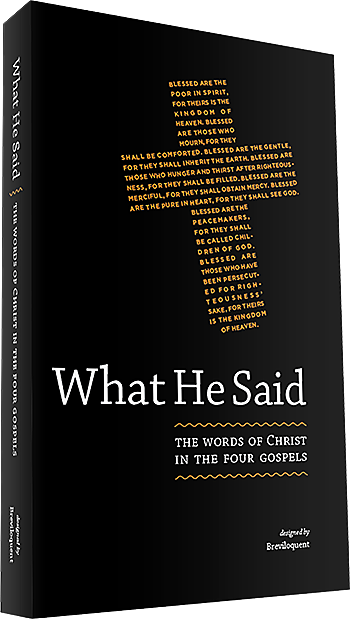 What He Said presents His words, as they appear in the Four Gospels, in a brand new layout designed to be easy to read and explore. Unique 3-column format prominently displays Jesus’ quotes in large, dark type. All of His words appear—in order and without editorial comments. Supporting chapter and verse text provides valuable context. Small and portable size slips into handbags, briefcases and backpacks. Fresh design perspective provides an innovative new resource for Bible study groups, retreats, religious education, book clubs, and more.